Elliott Wave Theory is always considered as an effective financial market forecasting tool. Before reading this post, you should first read the post on Elliott Wave Theory, where you will be introduced with the impulsive five waves and corrective three waves development, and how they form the complete market cycle, which contains the waves of different degrees. The techniques that allow to predict the waves increase the effectiveness of your wave analysis. When I first found the techniques, the exclamatory word that came in my mind was "WOW!". Let me explain how you can predict the impulsive five waves and corrective three waves with the 1.618 and 0.618 ratios. Here I am considering only actionary waves, which are the waves towards the trend e.g. wave-1, wave-3 and wave-5. In the above image, I have explained the way to predict the end of impulsive fifth wave with the golden ratio. Golden ratio is 1.618, which is denoted by capital Phi commonly found in the nature and structure. Read this post to know more about Golden Ratio. 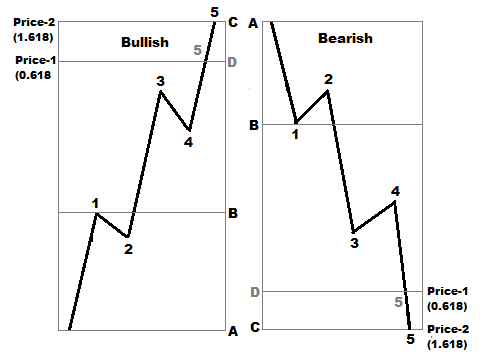 Traders actually need the price at point C, the ending point of wave-5, to forecast the next move of the market. 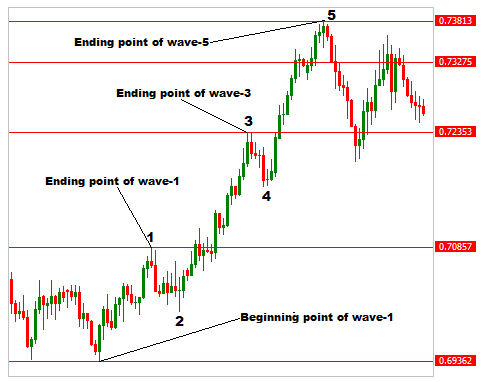 According to the Elliott Wave Theory, corrective three waves are expected just after the impulsive five waves. In the above image, I explained the way to predict the end of wave-5 with 0.618 ratio. 0.618 ratio is denoted by small phi. Here B point is the ending point of wave-3. Mentionable, this step can only be done when the wave-3 is already formed otherwise not. Applying the aforementioned formulas, we get two different price levels for the ending point of wave-5.See the illustration below. The ending point of wave-5 can lie on any of the price or on the price band between the price levels. 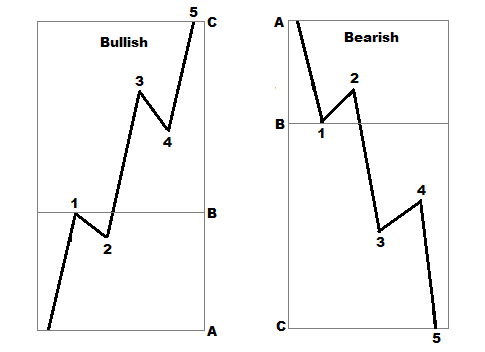 In the image below, we can see two price levels are found applying the above two techniques. In the image below, I have shown how the above techniques can be applied on the real price chart. The following price chart is a AUD/USD price chart, and we will apply the techniques on it. So in this case, the price band found applying the two formulas of predicting the end of wave-5 is 0.73275-0.74201. Consequently, the end of wave five, point C, may lie on the found price band. have a look at the illustration below. We can clearly see that the ending point of wave-5 lies on the 0.73275-0.74201price band. In some cases, the ending point of wave-5 may be found exactly on any of the price found from the two techniques. 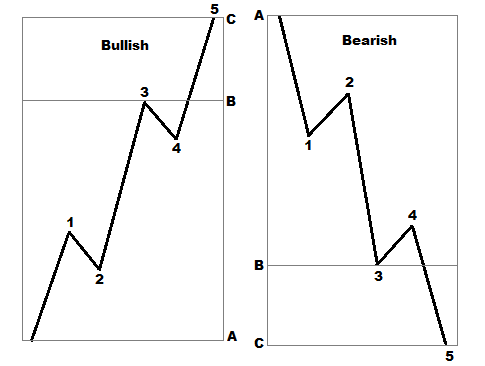 Generally, the traders should assume that the ending point of wave-5 will lie within the two prices found, and the exact ending point of wave-5 should be determined by any other technical analysis tools, specially harmonic chart pattern formation, or any strong resistance or support levels. These are the most commonly applied techniques to predict the end of impulsive five waves. In my next post, I will talk about some other techniques to predict the impulsive five waves e.g. using the reactionary waves or corrections.